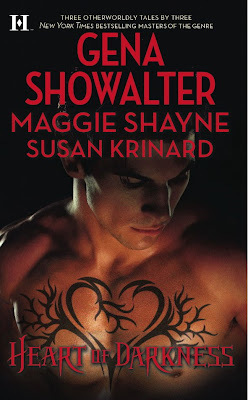 Gena Showalter unveiled the cover for Heart of Darkness featuring three novella's; The Darkest Angel ( a Lords of the Underworld tale) by Gena Showalter, Love Me to Death by Maggie Shayne and Lady of the Nile (Lord of the Nile spin-off story) by Susan Krinard. The book releases Jan. 1, 2010. Automatically I'm intrigued because I've read books by Showalter and Shayne and really enjoyed them. I just picked up the first three LOTU and it looks like this would be an excellent addition. Thanks for sharing Doug! Ladytink they are also a great introduction at novella length for new readers to these writers. Leontine the vid is now on my TODO list!